Mayflower. Trailing-arbutus has long evoked rich sentiments in poetry and lore. In New England and elsewhere, the common name is mayflower. This name is said to date to the Pilgrims, who found it abundant around Plymouth, Massachusetts, and the first bloom to assure them that their first terrible winter was over. John Greenleaf Whittier wrote a poem, “The Mayflowers,” that captures the timeless lure of this wildflower. As the name of the English hawthorn and the ship that brought them to America, “Mayflower” evoked fond memories for the Pilgrims. The scientific name, Epigaea repens, coined by Linnaeus in 1753 from Greek and Latin, literally means “creeping (or running) on the earth.” His species was based in part on Virginia specimens. Trailing-arbutus is an unpretentious, little, evergreen shrub that trails on the forest floor. It is an early harbinger of spring, much beloved for braving late-winter’s cold to produce spicy, pinkish-white blooms among its leathery, veiny leaves. The frosty flowers seem to epitomize purity and virtue. Trailing-arbutus is a “belly” plant: one must lie on one’s stomach to catch a legitimate moment of putting eye and nose to the beauty and perfume. Though widespread in Virginia, it is always rare and fragile here and a joy to find. Epigaea repens, as also last year’s Wildflower of the Year (Rhododendron calendulaceum), belongs to the cosmopolitan Heath Family, Ericaceae, which comprises about 100 genera and 3000 species, mostly shrubs. More than 200 species in over 30 genera are native or naturalized in the continental United States and Canada, including many other well known wildflowers such as heather, mountain-laurel, and wintergreen. Numerous species of Rhododendron and other genera, notably Vaccinium (cranberries and blueberries), are economically important. The genus Epigaea includes only two other species, one in the Caucasus region and the other in Japan. The scarcely shrubby trailing-arbutus is a tough, slightly woody, more or less rough-hairy plant with light brown, creeping stems and alternate, olive-green leaves. The hairs are rust-colored. It lies nearly flat on the ground and may form large carpeting patches in the right habitat, although often the patches are small and seem to be hanging on by a thread. The blunt oval or elliptical leaves, up to 4 inches long and 2 inches wide, are conspicuously net-veined and become pale and rust-spotted with age, eventually browning and dying on the stem. The plants always look a bit weather-worn, but, especially in spring before the new leaves have emerged fully, a live plant or colony may look so tattered as to pass for dead or dying. The waxy, exquisitely sweet-scented flowers are white to pale pink, the pink intensifying with age. The small, crowded clusters are borne in the axils of the leaves and at the tips of the stems and often are hidden from view by the leaves, especially early in the season. The tubular corolla is up to a half-inch or so long and nearly as wide at the mouth, where it expands into 5 spreading lobes. The inside of the tube is very hairy. The species is dioecious, having the sexes segregated on different plants. Even though they look more or less alike, the flowers of some plants are functionally staminate (male) and of others, functionally pistillate (female). The flower produces nectar and is commonly visited by early queen bumblebees of several species. The small fruit is a fleshy, 5-chambered, many-seeded capsule that splits open at maturity. Ants then disperse the seeds. Many authorities, including VNPS founder Mary Painter, caution that trailing-arbutus is almost impossible to cultivate by any means, and native plant gardeners should not attempt to grow it. Attempts to transplant it will almost certainly fail and, in the process, result in the further destruction of the species in the wild. 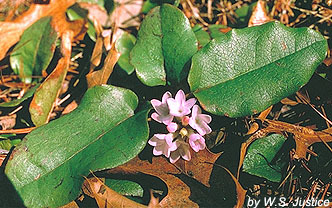 Trailing-arbutus typically grows in sandy or rocky, acid soils in woods and clearings, often on hillsides and banks, including road banks, especially under oaks and pines or hemlocks with such other ericads as mountain-laurel. It is native throughout eastern North America, from Labrador to Manitoba and south to Florida and Mississippi. Despite its wide range, however, it seldom is common and usually is rare, localized by its specialized ecology. Over its range as a whole, it blooms from February to May. Trailing-arbutus has been reported from nearly all counties in Virginia, but doubtless many former colonies no longer exist (see native distribution in Atlas of the Virginia Flora, III, 1992). In the Washington, DC, area its average date of first blooming is April 5. Trailing-arbutus or mayflower is a rare piece of Virginia’s natural endowment, now gone from many localities where it once was common. Every wildflower lover should learn to recognize it, not only for its history, sentiment, and beauty, but also to champion its protection from further destruction. Its prostrate habit makes it easy to gather, as once was commonly done to perfume the bedside and cheer the sick or to sell in the markets, but because of its short, thin stems picking always uproots some of the plant. The species is very intolerant of habitat disturbance in any form, including fire, logging, grazing, and housing development, and serious deer overpopulation is wiping out many old colonies. Gardeners should not transplant trailing-arbutus from the wild nor purchase the species from a nursery, because in all likelihood plants for sale are from the wild and will perish in any event. Text by Stanwyn G. Shetler for the 2001 Virginia Wildflower of the Year brochure and edited by him for the Web.